Our partners make a significant impact in the lives of San Diego youth and in the promotion and support of the San Diego mentoring movement. Founded in 1981, by Frank and Linnea Arrington, San Diego Funding has helped thousands of homeowners finance their dream homes. Frank, who served on the Board of Big Brothers Big Sisters for more than 34 years and was a long-time Big Brother himself, left a legacy of giving back when he past in September of 2013. His wife, Linnea, President of San Diego Funding, along with the Arrington family have continued to be consistent supporters of Big Brothers Big Sisters, specifically funding BBBS Operation Bigs and Community Mentoring programs. 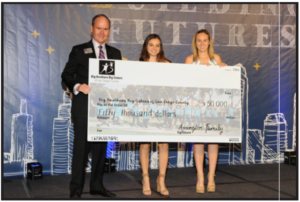 Granddaughters, Aly and Lily Arrington, participate in Big Brothers Big Sisters Gourmet Dinner annually, presenting a $50,000 check on behalf of their family to support life-changing youth mentoring. Inspired by their giving, Great Pacific Escrow, decided to give back to BBBS for every escrow closed in 2016, donating $8,200 in their first year of giving. The San Diego Downtown Breakfast Rotary has been a valued community partner to BBBS of SDC since 2012. For the past five years, the San Downton Breakfast Rotary has chosen our military child mentoring program, Operation Bigs, as a beneficiary of their annual charitable golf tournament, Holes for Heroes, and has raised $31,000 through this event for BBBS. In addition, Rotary members give of their time as volunteer mentors to our children and help to promote the importance and value of our mentoring programs throughout their membership and networks.